When we started Pipedrive, one of our key ideas was that we would always aim to keep things as simple as possible. But as time passed, not only has the program itself grown, but the diversity of our user-base has as well. We’ve often found ourselves surprised at the inventive uses people have found for Pipedrive. This has however meant that our users’ needs have become more complex over time. The need to service this diverse client pool has naturally led us to the point where we saw the opportunity to create different levels within Pipedrive for the very first time. It stands to reason that a user who has 2,000 customers and 100 salespeople does not have the same needs as one who serves 50 customers with four salespeople. But it would make no sense to force the smaller user to adopt the features the larger one needs, nor to carry an increase in price for features they will not use. Thus, our new tiered pricing system. We feel it creates the scope to serve a larger number of user needs while maintaining flexibility and choice. You only pay for what you need. If you’re an existing customer, this is the Pipedrive you know and love. At a standard 12 EUR/USD per user, per month, this plan includes all the features you've used to date. The Silver plan features our Smart Email Bcc solution as the key way to integrate email with Pipedrive. Silver is ideal for customers who need full sales management features but who are not sending or receiving massive amounts of email, or who don’t see email as an integral part of sales or record keeping. This remains our best value plan and tailor made for those trying out Pipedrive for the first time, or companies that are keen to have a low-cost sales CRM solution that still has all the power needed to drive big sales. The key advantage of the Gold plan is automation, and for launch we are releasing the first of our automation innovations - Full Email Sync. 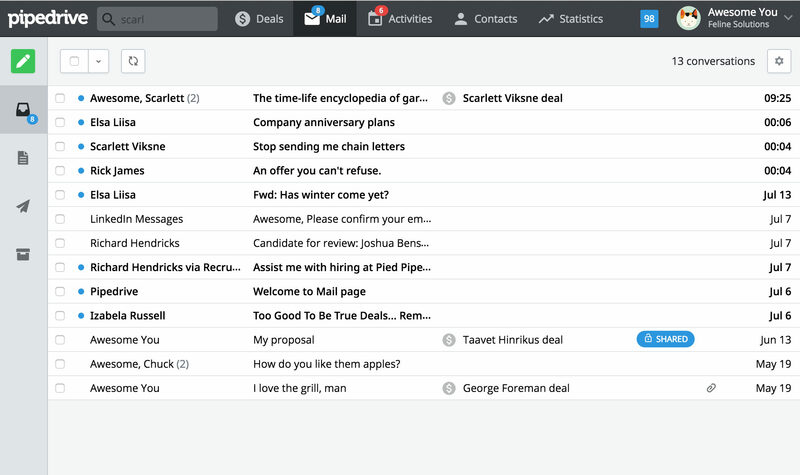 This allows you to connect Pipedrive to an email client of your choice and experience the time-saving wonder of 2-way email syncing. 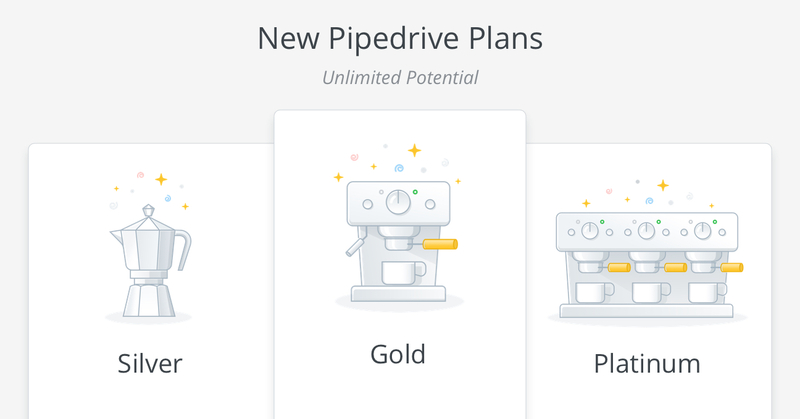 Under the Gold plan, emails tied to deals or contacts will now automatically appear inside Pipedrive, and you can send mail directly from the deal or contact page on the platform. Full Email Sync offers huge savings in time alone, as you’re no longer switching back-and-forth between email and Pipedrive, while all the information and correspondence you need is right there on your deal or contact page. It also completely eliminates human error as there is no reliance on users remembering to Bcc every time. In addition, each Gold plan user gets 5GB of storage in comparison to the 2GB available on the Silver plan. 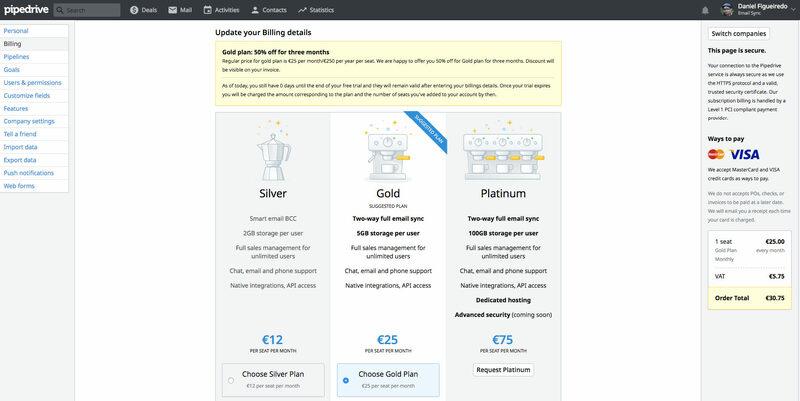 The Gold plan costs 25 EUR/USD per user, per month. Full Email Sync comes as standard with the Platinum plan, which also brings you the speed and accessibility of dedicated, unshared hosting, and a set of advanced security features like single sign-on and an audit log scheduled for release in the near future. This is also the ideal plan for organizations with high data storage needs as you receive 100GB of storage space per user. All of this comes at 75EUR/USD per user per month. Note about storage: There is currently no way to check how much of your storage space has been used in the app. Of course, we are working on making that information freely available. In the meantime, users who are close to hitting storage limits will be notified well in advance and we will never, ever cut your service, even if you hit your limit. You will also not be automatically upgraded, regardless of how much storage you have used. Our analysis shows that the basic 2GB per user limit covers the storage needs of most customers even if they use Pipedrive actively. Simply visit your billing page and select the plan that suits your needs. You can upgrade at any time, even if you’ve paid for your existing plan in advance. 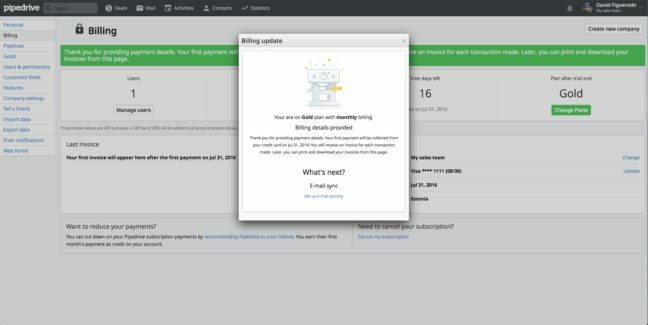 If you have any other queries about Tiered pricing, visit this handy FAQ, which should help you out, while we answer the most pertinent billing questions here.